Good morning from a very wet Lincolnshire, let's hope the sun soon has his hat back on!!. Hopefully looking all of the Inkoids samples will make you smile and forget about the wet weather. This sample is my hubby's favourite. We both think that these little chicks are so cute, and I'm sure you will agree when you get to play with them. 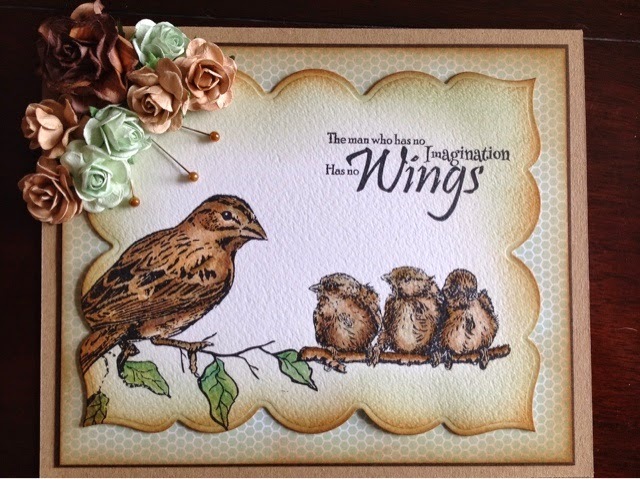 I have stamped the images with Stayzon, and then water coloured with Distress pens. Distress ink around the edges (vintage photo and bundled sage), and the paper is some from my stash. The flowers were from my ever growing flower box!!!!. I hope you like this one, and don't forget to look at all the other Inkoids samples on their blog. You can get all the Inkoids blog addresses from Sheena's blog page. So don't forget to tune in on Friday to see the lady herself at 11am, 4pm and 7pm. I can understand why this is hubby's favourite - it's gorgeous and so cute!